【キースのブログ10】A Month in Australia, My Hometown. It’s been a long time since my last blog. I was too busy with study and I kept forgetting to write them. I recently returned to Australia to change my Visa. I arrived back in Japan about two months ago. For my first blog since coming back to Japan, I thought I’d tell you all about Australia. I was there for a whole month, so I have lots of photos to show and stories to tell! I was only there for a day during my trip, but I was able to visit some of my favourite places. Freo is famous for a few things. Number one is the restaurants! Freo is well known in Perth for having some of the best restaurants in the state, especially Italian and Asian restaurants. My favourite restaurant in Freo is a place called “Taka’s Kitchen”. It’s a cheap Japanese restaurant in Fremantle’s food court. It isn’t super high-quality or expensive. It’s cheap, normal food. But, I’ve been eating at Taka’s Kitchen since I was 4 years old! So, it holds a special place in my heart. I was really happy to eat there again. It tasted really nostalgic! 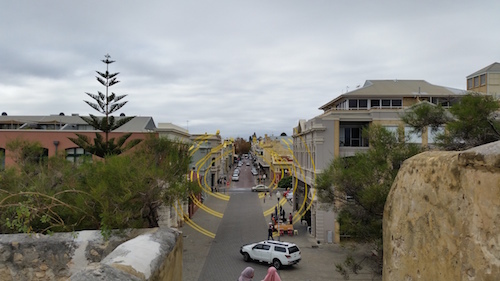 For the rest of the day, I just walked around Fremantle, seeing some familiar places. I went to a place called “The Roundhouse”, which is small building that was used as a prison in the past. My last destinations were the “Esplanade Park”, a park close to the harbour, which is Freo’s most popular spot for families and “Little Creatures”, my favourite brewery/bar in Fremantle. It really did make me happy to visit my hometown again. I hadn’t seen it in two whole years! I love Fukuoka, but I do miss Perth and Fremantle. I hope I can go back to visit again sometime soon.